Dart prepares an instrument brought in by a client for repairs. (Photo by Rachel Ebel) Located in the heart of Anderson Valley, Dart Instruments has become an iconic landing spot for many musicians in search of custom made stringed instruments. The shop lies relaxed to the side of the highway in between Philo and Navarro. Specializing in guitars, mandolins and acoustic lap steel guitars, the brand has earned a respected reputation in the music community. David Dart began his career building instruments in 1966. He started playing guitar around age 10 and made his first guitar at age 16. “As I got older I had a little guitar but I wanted a fancy one. I got an old one, and it was a fancy parlor guitar, but it was trashed. It didn’t have a bridge, and it was split in the back, and a lot of the abalone inlay was missing and I just gradually fixed it up. And I got into it after that. I made myself an Appalachian dulcimer after that. Then a mandolin, which I compared to other mandolins after a science project for my high school senior project. Mine, of course, came out better,” smiles Dart. He never looked back and has since indulged in the artistry of building instruments, becoming a respected “luthier,” the name used for a builder of stringed instruments. Dart grew up and lived in Southern California before coming to Mendocino County in 1978, after spending some time on the road. Deciding to settle down and raise a family, he purchased and opened up his workshop and showroom in Philo in 1986. Dart Instruments has become an iconic landing spot for custom handmade instruments. (Photo by Rachel Ebel–for Ukiah Daily Journal) While newer technology opens up new tools and methods to speed up the process for luthiers, Dart prefers to keep his way traditional. He likes to hand draw each design with stencils and collected templates, and his shop is decorated with years of accumulated tools, models and wood from past projects. A unique tool that he uses is called the “bending iron,” which contains a metal mold shaped like the side of the instrument desired. With many sizes to choose from, the bending iron warms up with heat generated by light bulbs to shape wood for the instrument sides. The process requires a gentle balance between applying heat, shaping and spraying water along the way. Dart mentions that one of his recent projects was made using an old floorboard from a sheep barn nearby. “For the wood, I get it wherever I can. Mostly I get wood in as much bulk as I can, and I’ve got saws so we can cut down to the right size but it started with buying a good board from somewhere or trading,” Dart adds. A lot of the local wood used includes cypress from Point Arena, acacia from Marin County and cherry grown from Anderson Valley. Each instrument will recognize the type of wood and where it is from on its inside label. “Each type of wood is all going to sound different because of the different weight. I’m anxious to see how they sound,” says Dart. Though Dart is known for creating unique types of stringed instruments, his most famous creations have been ukuleles and guitars of various sizes. Over the years, musicians have approached Dart for custom-built instruments. He recounts an experience he had creating a lap steel guitar for musician and songwriter Ben Harper. Harper had wanted a model with a specific kind of back so that it would be less likely to fall off the lap when playing, which Dart had designed and built. For many years, Dart worked on his instruments solo before deciding to hire Geoff Yensen in 2014 as an assistant. Yensen was new to the area and had met Dart through a mutual friend. Assistant Geoff Yenson has been working with Dart for the last five years. (Photo by Rachel Ebel–for Ukiah Daily Journal) “I came by and talked to Dave, and he agreed to let me shadow him in the shop, and he’s been bringing me along since then. I spent about a year working for a shop down in Santa Cruz, and it was a good experience. Think I’ve always been a bit of a tinkerer, and I used to be interested in how the thing worked, and I’ve always wanted to sort of get into it,” shares Yensen, who prefers to work with Dart one-on-one. Going into 55 years of building instruments, Dart plans to continue for as long as he can. This year, Dart and Yensen look forward to visiting the Grass Valley Bluegrass Festival and anticipate networking in the luthier pavilion. They generally like to make appearances at the local ukulele festivals and hope to make it to more local events. “It’s a fun thing to do, and it stays fun. I still have things that I’m anxious to make,” concludes Dart. Dart Instruments is located at 520 Hwy. 128 in Philo, and you can visit their Instagram or their website at http://www.luthier.com for more information. 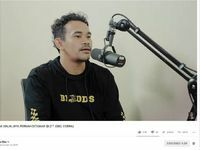 Andi Video – Raditya Dika berbincang dengan salah satu komika Tanah Air, Ebel Cobra, untuk podcast terbarunya. #ginjal komika ini pernah ditawar rp 60 juta, #raditya dika: ya allah!